Every facility can benefit from high-speed doors. Food Processors and Pharmaceutical companies no longer have to shut down production lines for costly door repairs. Manufacturers need to keep traffic moving. 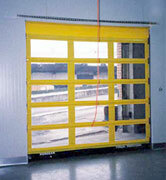 High speed doors not only save man hours but are proven to prevent wear on forklifts and equipment. Auto Dealers realize energy savings as well as labor savings by using high speed productivity doors. Cold Storage companies will save energy by eliminating infrared heaters and air curtains as well as saving time by using high speed freezer and cooler doors.